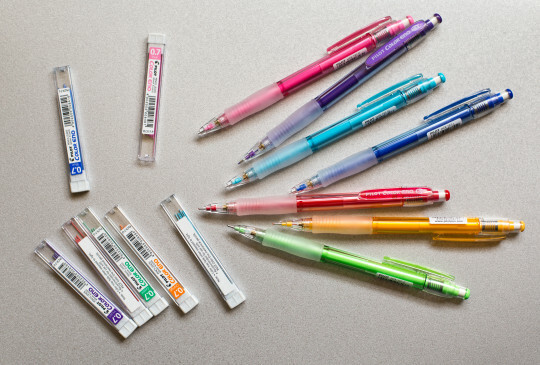 Recently I ordered a set of seven Pilot Color Eno mechanical pencils. One reason why I bought them was that I wanted to try them for a long time: Last year I asked Fudepens to put one for me aside, so that I can get it when they get the Orenz again, but somehow they didn’t get more Orenz pens and postage-wise it wasn’t worth ordering the Color Eno by itself. Another reason was that they were very cheap. On eBay I paid $19.99 (~£12.80; €18.20) for seven Color Eno pencils and seven packs of coloured leads – including free postage. I ordered them on 25 July and already got them on 31 July, despite them having had to travel around the globe from Hong Kong to the UK. The reason why I wanted to try the Color Eno for a long time is its sliding sleeve, more about these in one of my previous blog posts ((I thought I found out about the Color Eno on Lexikaliker’s blog, but couldn’t find it when I looked again. )). I sometimes use coloured pencil leads at work. One of my dedicated pencils for coloured leads was a Faber-Castell Grip Matic (the auto advancing kind). If you know how to use it it was fine, but every time a colleague would grab it to write with it they would break the soft coloured leads and generally clog the Grip Matic up. An easy to handle mechanical pencil for coloured leads did therefore sound like a really good idea. My first impressions of the Color Eno are not so positive. It is a nice pencil in itself, with such a close similarity to the Super Grip1 (both from Pilot), but the feature I wanted it for, the sliding sleeve, doesn’t work for me. It does work for me when I use the Super Grip, though2. The sleeve doesn’t slide back when I write. It might work for others, especially if you hold your pen in a vertical or near vertical position. My first idea was that this is because or a combination of force needed to push the sleeve back and sleeve thickness. 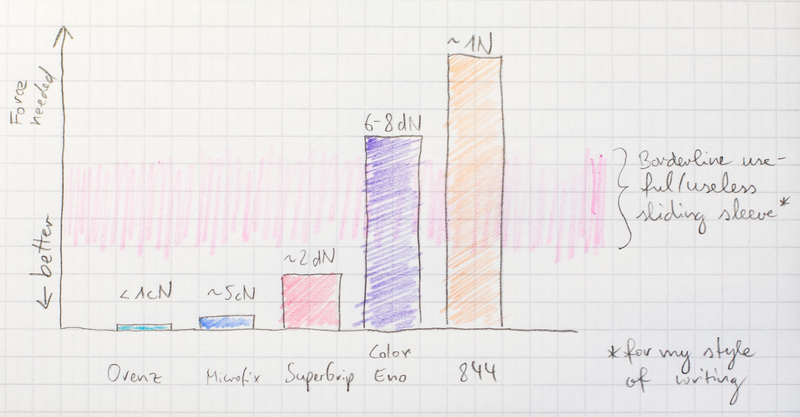 After comparing the Color Eno to other sliding sleeve pencils I think the thickness of the Color Eno‘s sleeve doesn’t really matter that much. The Color Eno’s sleeve doesn’t glide back so after a while you write on the sleeve. Not so with the Orenz. A little warning regarding my chart: I have neither the training, nor experience, nor the equipment to take these measurements properly, so you better take these measurements with a pinch of salt, or even better with a whole lorryload full of salt. The Pentel Orenz works with 0.2 mm leads. The sleeve has an other diameter of ~0.6 mm. You need less than 1 cN to slide the sleeve. You might have read from Lexikaliker that the Orenz will be available in Germany from autumn 2015. The good news is that the Orenz will officially come to the UK, too. From January 2016 it will be available in 0.2 mm and 0.3 mm. 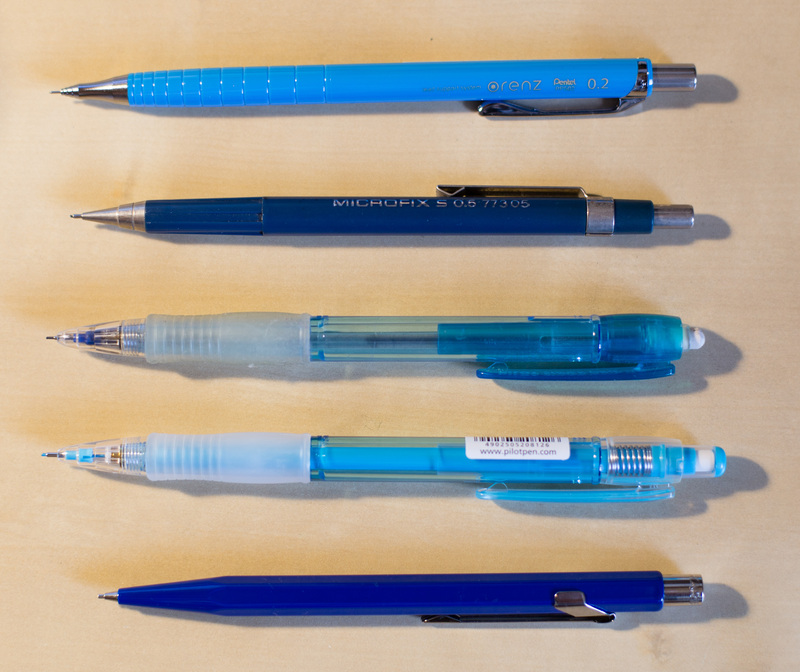 The Staedtler Microfix works with 0.5 mm leads. The sleeve has an other diameter of ~1 mm. It is not being manufactured anymore. You need less than 5 cN to slide the sleeve. The Pilot Super Grip works with 0.5 mm leads. The sleeve has an other diameter of ~1 mm. You need less than 2 dN to slide the sleeve. My version was bought nearly 15 years ago, so I am not sure whether the current version needs the same force to slide the sleeve. 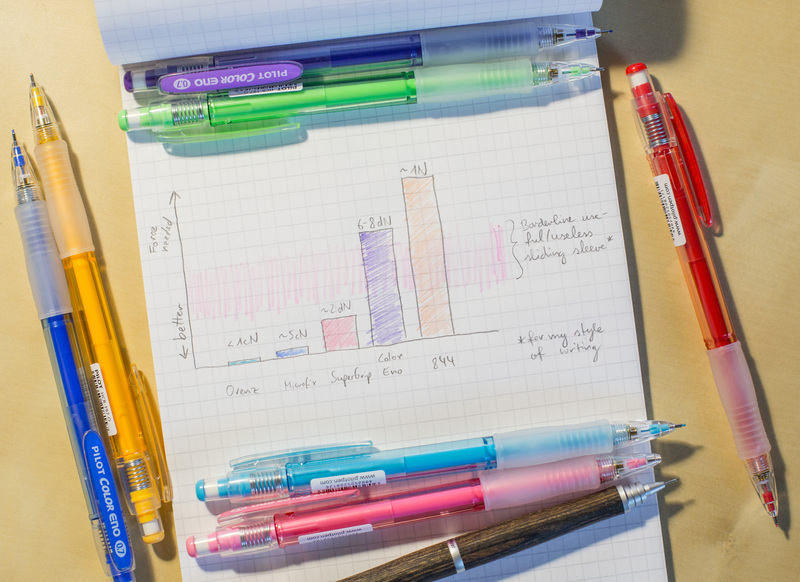 The Pilot Color Eno works with 0.7 mm leads. The sleeve has an other diameter of ~1.1 mm. You need about 6 – 8 dN to slide the sleeve (different force needed on the different versions I have of this pencil). 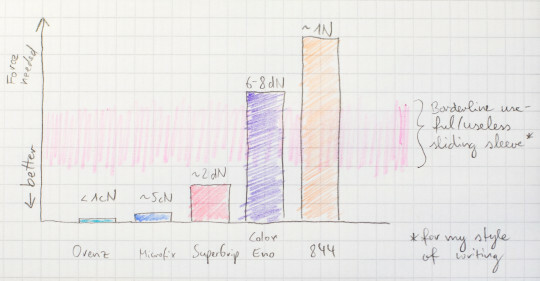 The Caran d’Ache 844 works with 0.7 mm leads. The sleeve has an other diameter of ~1.05 mm. You need about 1 N to slide the sleeve. More about the Color Eno on Sola’s Blog. Matthias, it’s embarrassing to be linked from your very informative post – it’s so obvious mine was written by someone who knows nothing about mechanical pencils! I wasn’t aware that the Eno employed sliding sleeves (and I don’t think I’ve ever used one that impressed me with that function). Have you tried the 0.5mm Pentel PS315 (available on eBay for around US$10). There is also a 0.3mm Pentel PS523 that is usually harder to find, and generally more expensive. My current favorite is the TWSBI Precision with the retractable tip. It is US$25 off their website (http://www.twsbi.com/collections/pens-pencils/products/twsbi-precision-mechanical-pencil). Sola, it’s not like that at all! I don’t even know what to reply to your comment. Your blog is so great and it is easy to miss a sliding sleeve. I don’t think I noticed the sliding sleeve on the Microfix or the Super Grip in the past. You just keep writing and it just works – the way it should. Only when you switch back to a fixed sleeve will you notice that it is less comfortable, because you have to ‘click’ more often. Plus, as mentioned in the post, the Color Eno’s sleeve doesn’t work (at least not for me). Jimmy, I haven’t tried the Pentels you mentioned, despite me mentioning them in a previous blog post. I nearly bought the TWSBI after you mentioned it in a previous comment, but Philip from TWSBI told me ‘Matthias there is a retractable version of our pencil is the “retractable” kind. The tip can slide back in but its not designed to slide back and forth as you are writing so probably not the kind of sliding you are thinking of.’ So I thought I better don’t spend that money until I had a chance to try it in a shop (I fear however it will take a long time before I find a shop stocking them). Re sliding sleeve: all I notice about the sleeve is whether it tucks into the pencil or not after use. I don’t watch closely when I’m using it and I let out more lead before it gets too short, so for people like me it’s easy to miss I guess.